by RW Bro. Celil Layiktez P.Asst. G. M.
Note: The archives of lodges in Turkey, prior to the foundation of the Grand Lodge in 1909, were in the hands of foreign obediences. These documents were lost due to wars, persecution, fires etc. I was able to reconstruct the history of Freemasonry in Turkey through a research in the archives of the Grand Orient de France, preserved from the Germans during the occupation in the Bibliothèque Nationale Française (1890 pages microfilmed), plus the archives of the Grand Lodges of England, Ireland and Scotland. The Greek and Italian Masonic archives had been destroyed during the German occupation. A lodge which name is lost, operated in Istanbul, somewhere near the Galata tower, during the reign of Osman III (1703 – 1730). The lodge was founded probably c. 1721 by Levantines (mainly Genoese people) living in the tower quarters. The first known Turkish Mason is Sait Çelebi, ambassador to France and later grand vizier. The French officer, Count de Bonneval, after some intrigues in the French Court during the reign of Louis XIV, immigrated to England and later came to Turkey to reorganize the Turkish army. Count de Bonneval took a Turkish name and became Kumbaraci Ahmet Osman Pasha. It is said that he was a mason. Another known mason in this period is Ibrahim Müteferrika, who together with Sait Çelebi, started the first printing press used by Muslim subjects of the Ottoman Empire. (The Christians and Jews had their printing presses). 10 years after the excommunication of freemasonry by Clement XII, in 1748 Mahmud I, under the pressure of his Christian subjects and also the Muslim clergy, which thought that the Pope would not charge a fraternity with atheism in vein, outlawed freemasonry in the Ottoman Empire. An English lodge was sacked by the police, but as the British ambassador gave notice in due time, the list of members had been rescued. In the Vatican archives, there is a letter by the Pope congratulating the French Cardinal Tencin, and wishing that the same could be done in Naples. According to Gould, the British Consul in Aleppo, Alexander Drumond had been appointed as District Grand Master for the Orient by the Grand Lodge of England. Later in 1764, Dr. Dionysios Menasse had been appointed District Grand Master for Asiatic Turkey and Armenia. In 1786 a second charter had been given by the lodge Saint Jean d’Ecosse in Marseilles to the Lodge Saint Jean d’Ecosse des Nations Réunies in Izmir. The first charter had been lost during the big Izmir fire. According to the correspondence, this lodge had been consecrated after 1751 and before 1778. The lodge was closed in 1826. In the last decade of the 18th Century, Selim III’s step mother and counsellor in his foreign policy, Nakshidil Sultan (Wife of Abdulhamit I and mother of Mahmud II) was the cousin of Josephine, Napoléon’s wife. Under her influence, lodges from different obediences prospered in the Empire. But in 1826, Mahmut II abolished the Janissaries to create a modern army and outlawed the order of the Bektashis to which they all belonged. As Freemasonry was described as a “kind of Bektashism”, it was also closed and known freemasons were sent into exile. Mustafa Reshit Pasha, Grand Vizier, had promulgated the Reform Edict of 1839. It is said that he had been initiated while he was Ambassador to London. No evidence has been found for this initiation. His lodge is not known and as there were no family names at the time, the names of Reshit and Mustafa should be scanned, and even if found, it still could be someone else. His good friend, the British Ambassador to Istanbul, Lord Reading, was a known freemason. After 1839, with the unofficial permission by the Grand Vizier, Freemasonry had a slow revival in Turkey. The arrival of British, French and Piemontise expeditionary forces and diplomats in Istanbul and Izmir in 1856 led to an explosion of lodges under different obediences. In 1857 the short lived Grande Loge de Turquie was founded in Izmir, by the Grand Orient of France. After the end of the Crimean War, with the departure of foreigners, this grand lodge came to an end. In 1856, Captain Atkinson, an Irish officer in the 47th British Regiment, claiming to possess an Irish warrant created three lodges in Izmir and then “The Grand Lodge of the Ancient and Honourable Fraternity of Free and Accepted Masons of TURKEY”. (The Constitution of this grand lodge is in the Irish archives.) This was a fraudulent commercial enterprise. Atkinson initiated 200 masons and then disappeared with the funds. The irregular masons, initiated by Captain Atkinson, started to visit or join English and French lodges. There was literally a panic in London and in a swift move, Grand Master Lord Zetland ordered the foundation of the Provincial Grand Lodge of Turkey, in Istanbul, the first Provincial Grand Master being the British Ambassador Sir Henry Bulwer. The consecration ceremony took place on the 24th June 1862 in the Embassy. The founder (1861) and first Sovereign Commander of the Scottish Rite in Turkey (1864) was Prince Abdülhalim Pasha, or shortly, Halim Pasha, Brother of the Khedive (Governor of Egypt, attached to the Ottoman Empire) and uncle of the Khedive Ismail Pasha under whose rule the Suez Channel had been opened. 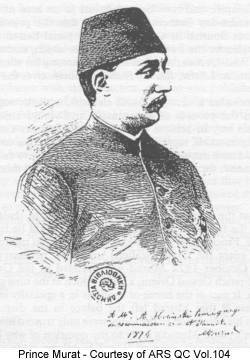 Halim Pasha was also Grand Master of the Provincial Grand Lodge of Egypt (English Constitution). In 1869 this Supreme Council has been recognized by the American Southern Jurisdiction. In 1869 Lord Bulwer had been recalled to London. The above mentioned Halim Pasha was in exile in Istanbul. Having good relations with the Sultan, he was proposed as Provincial Grand Master. But as his proficiency of the English language was not sufficient, an American, John Peter Brown, Secretary at the American Embassy and known writer and researcher of the Islamic mysticism was elected in his place. Hyde Clark, the P.D. Regional G.M. in a letter to a Bro. Harvey (2) in London, proposed that two Grand Masters should be elected together, Peter Brown for the current management of the Grand Lodge and Halim Pasha for his relations with the court. This proposition was not carried on. After Brown, in 1873 Bro.Stephen Scouloudi has been elected Grand Master. The Provincial Grand Lodge was run inefficiently. Dues were not or could not be collected. In 1884 when Scouloudi resigned, no one was elected in his place. At that time there were 4 English Lodges in Istanbul and 7 in Izmir. Three sons of Sultan Abdulmedjit, the Princes Murat (later Sultan Murat V) and two of his brothers, Nurettin and Kemalettin had been initiated in the French Lodge Prodoos. Five Grand Viziers, including Midhat Pasha who masterminded the first Constitutional Monarchic regime, Turkish ambassadors to European countries and foreign ambassadors to Turkey, famous freedom writers and poets were members of this lodge. Louis Amiable, French Lawyer and politician, writer of the history of the Lodge “les Neufs Soeurs” cradle of the Encyclopedists in Paris before the Revolution, was the Orator of the Lodge. (He was in Istanbul on contract to reorganize the Turkish Bar Association). After the suicide (?) of Sultan Abdulaziz, Prince Murat acceded to the throne on the 30th May 1876, but due to a mental illness, was deposed three months later and his brother Abdulhamit was enthroned, after bargaining with Bro. Midhat Pasha, and thus promising to start the constitutional process. He was not long to go back on his promise. On the 5th February 1878 Abdulhamit sent Grand Vizier Bro. Midhat Pasha in various exiles, finally to Taif (port city of Yemen, then a province of the Ottoman Empire) arranging his death by poisoning there. On the 13th February 1878 Abdulhamit adjourned the parliament indefinitely, starting a period of absolute despotism which lasted 30 years. Cleanti Scalieri, W.M. of the lodge Prodoos plotted a bloody but unsuccessful kidnapping of Murat V from the Ciragan Palace, to restore him on the throne. (Articles by Bro. Rizopoulos and myself in the Ars Quator Coronatorum Volumes 104 and 107). A Masonic political party : Union and Progress, created according to the model of the “Carbonaries” in Italy. After the model of Young Italians, Young Germans, Young Swiss, the Young Turks organized in Paris with the aim of bringing back the constitutional monarchy. But the Young Turks talked a lot but did not act. 5 Freemasons, military students in the faculty of medicine started a revolutionary party which later took the name of Union and Progress. Their model was the Italian paramasonic revolutionary society, the “Carbonaries”. In the second half of the 19th century, the main European powers had obtained an immunity for their subjects living in the Ottoman Empire. This immunity system was called “Capitulations”. The Turkish police did not have the right to search a house belonging to a foreign subject. Thus, the members of Union and Progress in Thessalonica plotted their revolution in Italian, French and Spanish lodges gathering in houses belonging to foreigners. To get around the Capitulations, the police organized a robbery in the temple of the lodge Macedonia Risorta, were the archives were kept, to obtain the members’ lists, but a freemason in the police force tipped in time the Worshipful Master of the lodge. The frustrated policemen took revenge on the furniture of the temple. The police tried also to harass the members, waiting in the street for them to leave the building. Abdulhamit knew very well what Freemasonry was about. As stated above, three of his brothers were freemasons. The princes Kemalettin and Nurettin were in line for the throne. Most of the European powers were governed by freemason kings and ministers. For these reasons, Abdulhamit did not want to alienate the Freemasons. On one side, while persecuting the revolutionary lodge members of the Italian, French and Spanish lodges in Thessalonica, he gave large donations to the charity efforts of English Lodges in Istanbul. He even planned the creation of a Grand Lodge in Istanbul, of which he would be the Grand Master. This lodge would act as a senate, assembling the leaders of the different warring communities in Istanbul, (mainly Turkish intellectuals, the members of the Italian, Levantine, Greek, Armenian and Jewish communities). This project was never realised but shows the intricacies of the way Abdulhamit’s mind worked. A great number of high ranking officers were Freemasons and also members of the Union and Progress Party, low ranking officers were not required to become Freemasons to be accepted into the Union and Progress Party, but they hoped to get a quicker promotion if they would be initiated first. The action of the Union and Progress Party, and its threat to invade Istanbul with the armies stationed in the Thrace, obliged Abdulhamit to promulgate once more the Constitutional Monarchy on the 23rd July 1908. The reaction was not long to come. On the 31st March 1909 the fundamentalists took the control of Istanbul. The freemasons in the Thrace, mainly from Thessalonica organised an army of reservists. Almost all officers were Freemasons. There were too many officers, some joined the expeditionary force as ordinary soldiers. The army took back Istanbul from the fundamentalists, there were bloody battles and hangings, and Abdulhamit was dethroned by a committee of 5 deputies, all of them Freemasons. As a result to all this, Freemasons became the hate center of fundamentalist Islam. 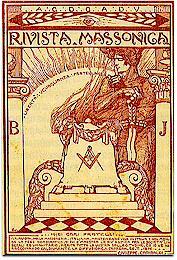 According to the French historian Thierry Zarcone, the period from 1908 to 1918 could be called “The Masonic State”. The Union and Progress Party in power used Freemasonry in its foreign relations. Deputations of mason parliamentarians went to Italy, France, Hungary and Germany. The Freemason deputies claimed that with their effort, democracy, that is the French slogan of liberty, equality and fraternity was prevailing now in Turkey and that the European powers should be of assistance. The Albanians had revolted against the Ottoman rule and the Italian parliament was about to vote an aid program for the rebels, but after the intervention of the Grand Lodge of Turkey, the Italian Freemasons in the parliament were effective and the motion did not pass. 11 months later, at the end of 1911, after Italy’s expedition to Libya (which was Ottoman territory at that time), the same scenario was repeated, but naturally this time the Grand Orient of Italy could not act against its own government. In answer to the letter from the Grand Lodge of Turkey, the Grand Master issued a very general statement on the 29th September 1911 (“Per l’Ingresso di Tripoli”, Rivista Massonica, 1911, No. 15-16) and the relations between the Italian And Turkish Grand Lodges were severely affected. On the 3rd March 1909, the dormant Supreme Council of Turkey (1861) was revived. This Supreme Council first consecrated 4 Turkish lodges. These 4 lodges plus 3 Italian, 2 French, 1 Spanish and 2 Egyptian lodges (One of them, Resne, English Constitution) assembled to form the Grand Lodge of Turkey on the 13th July 1909, and elected its first Grand Master, the Minister of the Interior Mehmet Talat S. Pasha, who later became Grand Vizier (Prime Minister). This Grand Lodge was consecrated by the Supreme Council. This Grand Lodge gave charters to a total of 66 lodges, mainly in Turkey but also in Egypt, Syria, Iraq, Greece, Lebanon and Palestine. In 1935, the year when Freemasonry decided to hibernate, 6 ministers, the President of the Parliament, more than 60 deputies and many state governors, were Freemasons, Ataturk’s private doctor, M. Kemal Oke, was a Past Grand Master. In 1935 the English, Germans and Russians transformed Turkey into a vast stage for propaganda and espionage. The Nazi propaganda machine was also stressing the Judeo-Masonic danger. The Ministry of the Interior, Sukru Kaya, a 33° Scottish Rite Mason, in order to curb these activities passed a law from parliament closing all clubs and societies. Freemasonry was not mentioned in the text, but the minister warned his brothers that it would be wiser to stop the activity of Freemasonry by its own free will. That’s how things happened and the reason why Freemasonry was able to recover its buildings after the war. All lodges did not close. The Supreme Council continued its activity behind closed doors, even chartered 3 new lodges. Craft lodges met at the homes of brothers. The police showed a knowing tolerance to all this, with the tacit approval of the President of the Republic Ismet Inonu, who even gave a little financial aid to the Supreme Council. Turkey wanted to be accepted to the U.N. The Turkish diplomats were told that Turkey was a totalitarian state, and that even Freemasonry was closed, as it was under all the totalitarian regimes. The President approached his personal doctor, Supreme Grand Commander (Scottish Rite) M. Kemal Oke, the same doctor who looked after Kemal Ataturk, and told him that the time to resume official working had come. In 1948 lodges, under the Supreme Council, started to labour in Istanbul and Izmir, and in 1949 in Ankara. A troubled period started with lodges trying to liberate themselves from the Supreme Council’s rule. The Grand Lodges of Istanbul, Ankara and Izmir were created, and finally those three grand lodges united on the 16th December 1956 to create a totally independent Grand Lodge of Turkey. After the initial recognition by some American and European Grand Lodges, in 1959 an official deputation by the Grand Lodge of Scotland visited Turkey. The recognition process was delayed to 1963, due to the military coup of 1960. Most of the regular grand lodges had recognized the Grand Lodge of Turkey, but England and Ireland. In order to satisfy them, the Grand Lodge of Turkey was reconsecrated by the Grand Lodge of Scotland in 1965. (That is why our Grand Officers’ regalia is green). In 1970 the Grand Lodges of England and Ireland recognized the Grand Lodge of Turkey. Friction was continuous between the Supreme Council and the Grand Lodge. At the end of 1964, The Grand Secretary, on his own, gave a letter to Bro. Suleyman Demirel, stating that he was not a freemason. The Grand Secretary was the Senior Warden of the lodge in which Demirel had been initiated in 1955. Demirel used this document against the fundamentalist wing in his political party, was thus elected to the Presidence of the party and reigned on Turkish Politics until 2000, when he retired as President of the Republic. In the 1965 Grand Master elections, the Bro. who issued this letter was elected, in spite of the Supreme Council’s secret opposition. The Supreme Council preferred the election of a Bro. who would be obedient to them and tried to cancel these elections. This led to a lot of turbulence in the ranks of Turkish Freemasons. Finally a schism occurred, with a small group of brothers creating a separate Grand Lodge, which later attached itself to the French Grand Orient. Today this irregular grand lodge has about 3000 members and is in relations with a Turkish Women’s Grand Lodge. This is a rather new outfit and has a few hundred members, organized in all major cities in Turkey. Today the Grand Lodge of Turkey has about 180 lodges with 12000 active members. It is recognized by all the regular grand lodges and is active, promoting freemasonry in the Balkans, Russia and ancient Soviet republics. We have a research Lodge which is publishing a quarterly research magazine “Mimar Sinan” (Sinan the Architect). Since 1991, I am publishing the bi-monthly Masonic magazine TESVIYE (level), in the name of the Grand Lodge of Turkey. (1) Bro. Rizopoulos’ article was published in the Turkish Masonic research Magazine, Mimar Sinan No. 118.